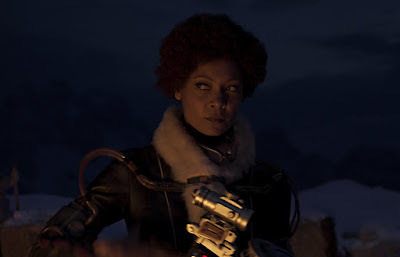 Solo: A Star Wars Story star Thandie Newton spoke with Entertainment Tonight this week and she spoke briefly about her role as Val in the film. Very little is known about Val, she was seen only briefly in the teaser trailer that was released last month, however Newton says that moment in the trailer tells you everything you need to know about the character. Newton said, "I think that the clip that you see [in the trailer], even though it’s really brief, tells you a lot. You know, there she is holding what looks like a weapon, and in a state of natural empowerment. You know, both the way she looks and her attitude. I loved playing the character. Loved it."